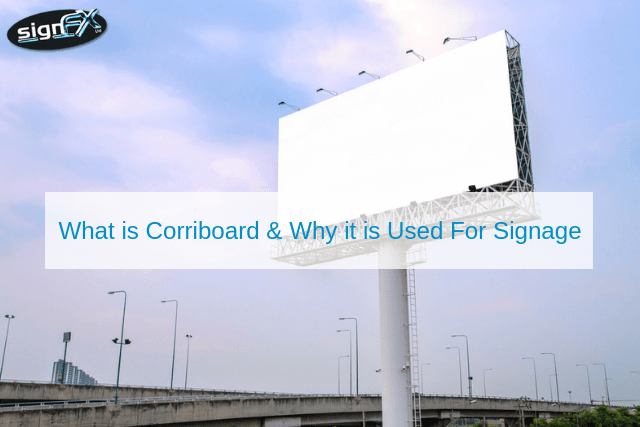 What is Corriboard and Why is it Used for Signage? You Are Here: Home / Blog / Blog / What is Corriboard and Why is it Used for Signage? Thanks to modern technology and a host of cutting-edge materials, there are a number of unique choices when choosing the right type of signage for your business. One interesting option is commonly referred to as Corriboard. As you might be unfamiliar with this method, it is a good idea to take a look at some of its primary benefits as well as why it could represent an excellent choice for your advertising needs. Corriboard is a fluted and rigid sheet of polypropylene. It contains two surface layers as well as a reinforced centre piece. In some ways, it is similar to the design characteristics of corrugated cardboard (hence the name). Corriboard is lightweight and extremely durable; making it the ideal choice for many advertising needs. As it is constructed from polypropylene, this type of material is also highly resistant to the elements. It is therefore often chosen when other substances such as paper or vinyl may encounter issues. Thanks to the use of modern CNC machining techniques, these signs can be cut to order on short notice; ideal if you are hoping to introduce your business to the public. It is also possible to order corriboard in a number of thicknesses. Corriboard is a relatively inexpensive form of signage thanks to the materials employed. However, it also boasts an impressive longevity when compared to other alternatives. These signs will not be damaged by ultraviolet rays and they will not split or crack. These are all great features if you plan on using such advertisements for an extended period of time. Please note that these very same aspects hold true in regards to indoor uses. Have you been searching for a cost-effective and reliable advertising solution for your business? If so, corriboard signs could represent an interesting alternative. Please contact a representative at Sign FX to learn more about the unique options at your disposal.